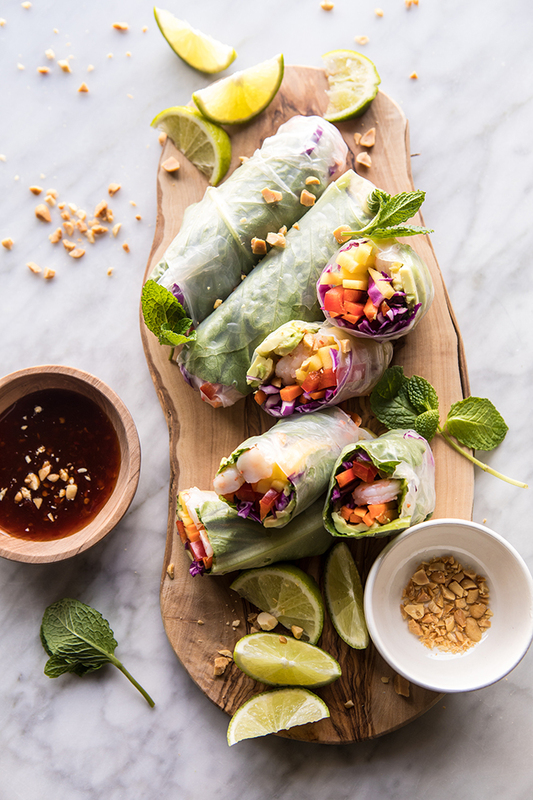 I really don’t enjoy the process of frying, so I love that summer rolls, unlike egg rolls or spring rolls, aren’t fried but are still the perfect ﬁnger food. They’re light and pretty and oh so yummy! I stuff these with all my favorites—fresh mango, avocado, bell peppers, and shredded cabbage—but you can make up your own mix of veggies. Zucchini would be amazing, as would shredded beets. Just have fun and be creative! One thing you can’t mess with, though, is the sweet Thai chili sauce. Trust me—just smother it all over! 1. I always like to prepare the sauce first. To do so, in a small bowl, whisk together the Thai chili sauce, soy sauce, ﬁsh sauce, tahini, lime zest, lime juice, ginger, and garlic until smooth and combined. 2. 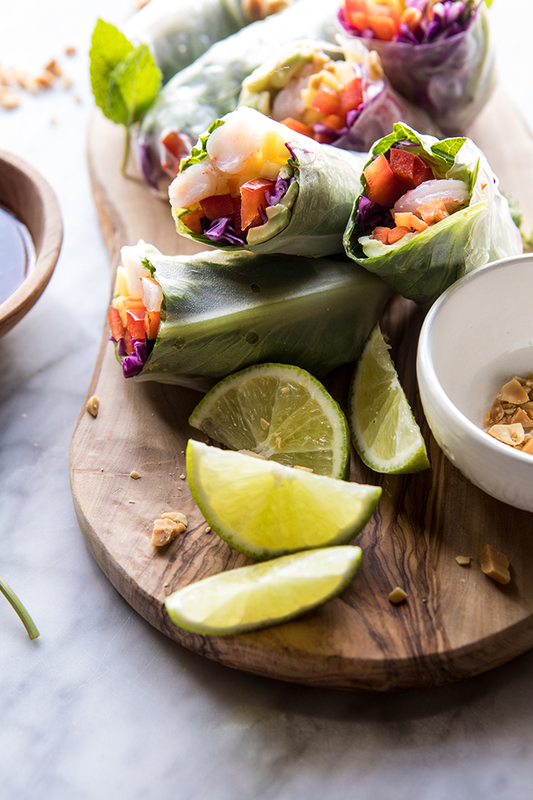 Now let’s make the summer rolls. Squeeze a little lime juice over the sliced avocado, being sure to coat the pieces so they don’t brown. 3. Set up an assembly line of the avocado, bell pepper, carrot, cabbage, herbs, mango, and shrimp. 4. Fill a shallow medium bowl with warm water. Working with one rice paper sheet at a time, soak the sheet in the warm water for about 10 seconds, until softened. Transfer to a work surface, narrow edge toward you. 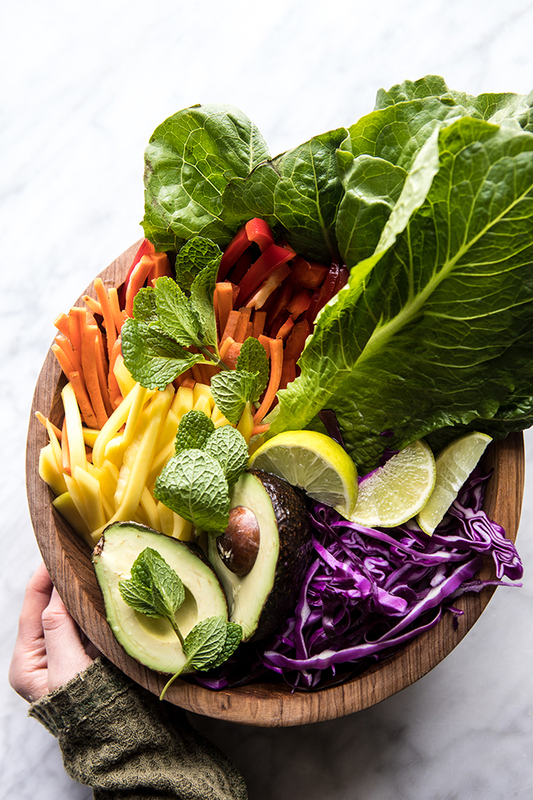 On the end of the rice paper closest to you, layer 1 or 2 slices of avocado, basil, mint, mango, 2 cooked shrimp, and a handful of the veggies. Be careful not to overstuff the wrappers. Season with pepper. 5. Fold both short sides into the center of the paper and roll the sheet away from your body as tightly as possible without ripping the wrapper. Place the ﬁnished rolls on a serving platter, seam-side down, and cover with a damp dish towel to keep the rolls from drying out. 6. Sprinkle the ﬁnished rolls with chopped peanuts, if desired. 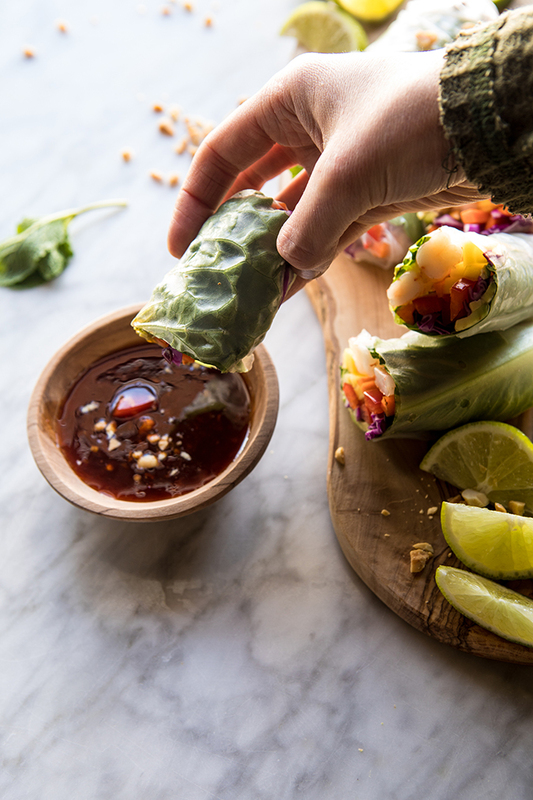 Serve with the sweet Thai chili sauce alongside for dipping. We can’t thank Tieghan enough for sharing such beautiful and delicious recipes with us here at Team LC. If you’re interested in trying out more of her yummy creations, be sure to pick up a copy of her cookbook here or check out her website. 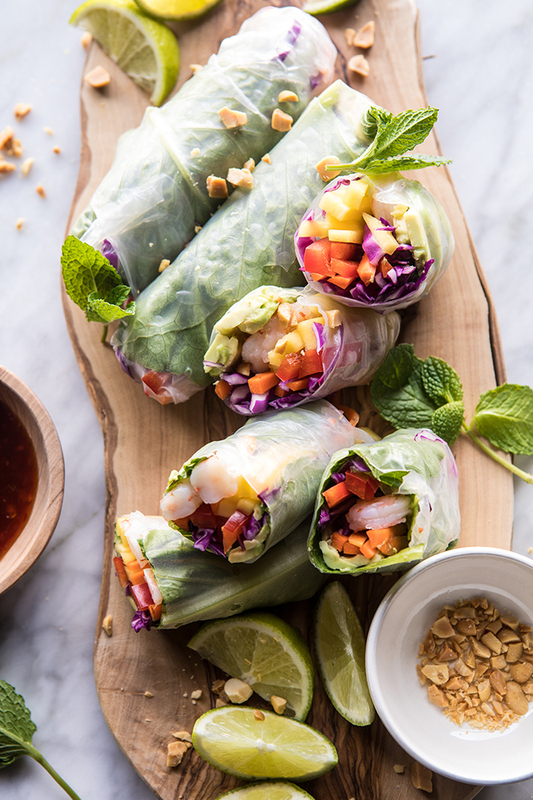 Will you be giving these summer rolls a try? P.S. You can shop The Little Market wooden serving pieces here.